You’ve enjoyed the magic of CircleFest and all that University Circle has to offer this season. You've taken the kids to Kringle's Inventionasium in Tower City and gone 'round and 'round the ice rink at Public Square. So how do you fill the forthcoming days of the kids’ holiday break? For those willing to venture over the river and through the wood, Fresh Water Cleveland offers up the following host of unique holiday activities, from a life-sized Candy Land game to gliding down a not-so-ominous Christmas Story slide. 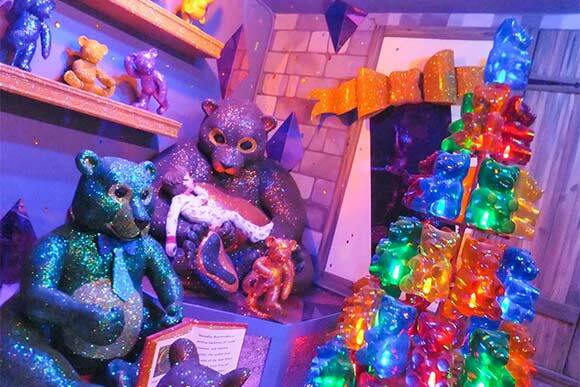 Castle Noel also features animated New York City Christmas window displays from Saks Fifth Avenue, Bloomingdale’s, Lord & Taylor, and Macy’s, as well as a vintage toy display with thousands of toys from 1950s through the 1980s. Other features include the Blizzard Vortex, Santa’s Chimney Squeeze and 25-foot-tall animated Christmas tree. Lastly, Drew Hocevar, who portrayed Santa’s Disgruntled Elf in A Christmas Story, will make appearances on Dec. 26 and 27 from noon until 5 p.m.
Tickets for ages 4 and older are $17 on weekdays and $18 on weekends. Reservations are encouraged during peak visit hours. Tour the facility at your own pace (typically 1.5 to 2 hours). Photos with Santa are $9.95. Bonus fun: Tuesdays in December are ugly sweater days. Round out your visit with a leisurely walk around Medina's charming Main Street. For a change of scenery, head to quirky Akron and celebrate winter by diving into classic seasonal activities – even if there's no snow. 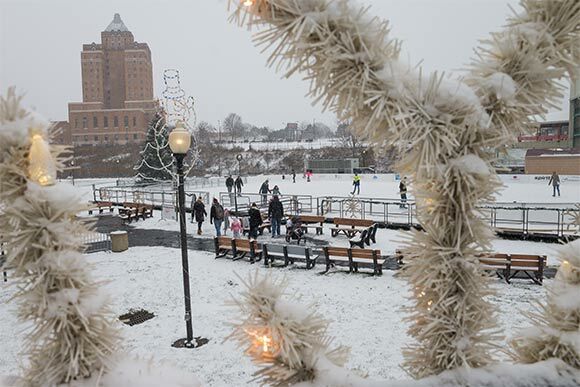 Sledding and ice skating are on tap at Lock 3’s Winter Fest (200 S. Main St. adjacent to the Ohio & Erie Canalway) through Feb. 20. Reindeer Run is a 150-foot polymer coated slide that can be enjoyed all season. (Only sleds provided by Lock 3 are permitted and cost $3 for 30 minutes for children 14 and under. Adults may accompany children on the slide.) Skate for free on Ohio’s largest seasonal 10,000-square-foot ice rink or the 28- by 48-foot synthetic rink (no ice = dry knickers) designed for beginners under 15 (bring your own skates or rent them on site for $3). When it gets too cold, play nine holes of indoor putt-putt golf for just $3. Other events include local celebrities reading holiday stories along with complimentary cookies and hot chocolate Dec. 17 and 18. The wooden cottages at Lock 3 will be filled with handmade wares from local artists and makers Saturdays from 11 a.m. until 7 p.m. and Sundays from 11 a.m. until 5 p.m. Also, Main Street between Bowery and State boasts Ohio’s largest seasonal vintage department store animated window displays, which may inspire nostalgia in those who shopped in Akron from the 1960s through the 1980s, so take a stroll by them on your way to or from Lock 3. Confidential to all cotton headed ninny muggins: tomorrow is the first ever elfcon. Celebrate the season like it’s 1864 at Holiday Lantern Tours at Hale Farm and Village. With a handcrafted holiday theme, the 90-minute, lantern-lit tour departs every 20 minutes starting at 6 p.m. Dec. 18 through 23. The village will be decked out in its historical finest and full of tales of a Civil War time holiday. Spinners will create holiday decorations, as families prepare their homes for visitors and make gifts for children. Carolers sing by candlelight as another family prepares food on an open hearth. Following the tour, guests are invited to Victorian-era holiday party. Advanced reservations required (330) 666-3711 ext. 1720 or halereservations@wrhs.org. Tickets are $20 for adults, $15 for members, and $12 for children ages 3-12. Of course there are shopping opps. The Marketplace at Hale Farm will be selling 'Handcrafted at Hale' gifts of hand-blown glass, candles, ironwork, brooms, and pottery, as well as pieces from other local artisans and “Made in Ohio” items. Goodies are available in the Hale Holiday Sweets shop, along with Ohio crafted wine and beer for frazzled ma's and pa's. Who could resist a stroll through Candy Land? Fans of the beloved childhood game big and small can play a free, super-sized version of it on a life-sized game board at The Wild Days of Winter at Penitentiary Glen Reservation (8668 Kirtland-Chardon Rd. in Kirtland). Participants draw cards and move through a magical wonderland exploring nature. There will also be special maple syrup event this Saturday, Dec. 17 from 1 to 3 p.m. and wildlife chats on Sundays during the exhibit, which runs through Jan. 1 from noon to 5 p.m. (closed Dec. 24, 25 and 31). Crafts, scavenger hunts, snacks and beverages are also available. The Nature Store features holiday shopping and snowshoe rental. While you’re out in Kirtland, don’t let Santa’s elves have all the fun this season, pick up some tools and join them! Kids enjoy the satisfaction of building their own toy at Daytime Toy Workshop. 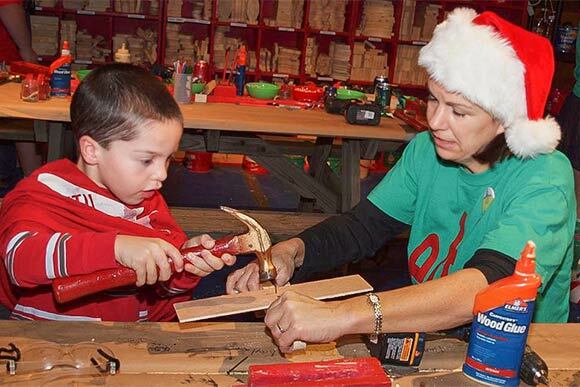 Open Dec. 27 through 31 from 10 a.m. until 3 p.m. (closes at 2:30 on Christmas Eve), kids ages 2 to 11 are invited to build a wooden toy of their choice with the help of one of Santa’s elves using drills, power screwdrivers, hammer and nails. An application of paint and glitter complete the new toy (cost: $2/per toy with regular Farmpark admission). Lake Metroparks Farmpark (8800 Euclid Chardon Rd. in Kirtland).